Note: As the vast majority of the visitors to this site use screens larger than 800x600, starting with this page we are setting the page width wider. On page one we noted that we had worked the area to the right of pocket 12 and found nothing. We needed to look harder. What originally appeared to be nothing more than a bootleg hole from a lifter, turned out to be more. A bootleg is that portion of a horizontally drilled hole that remains after blasting. A hole 'pulls' perfectly if there is no bootleg at all.... all of the rock is moved. In reality bootlegs are a fact of life. 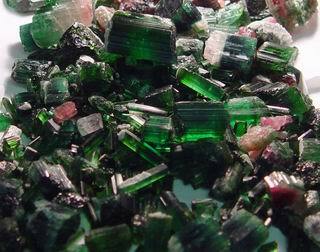 As noted on page one, a tourmaline druse led into pocket 12. We were able to follow a similar druse that led to a bootleg. This prompted us to probe the back of the bootleg with our long mongo bar. As we did so the bar began going in further and further. Digging blast holes as if there were pockets is locally known as 'digging a Pat pocket'. This dubious honor is named after a local miner, Pat Elkins. At first I had trouble convincing Richard this was not a Pat pocket pipe dream, but after he bailed out a few handfuls of pocket material (see image to the left), he became a true believer. As mentioned, we followed a druse of green tourmaline to this pocket, however another feature eventually caught our eye. This pocket seemed to have developed under a hood of microcline crystal(s). There were in fact small loose microcline 'bricks' in the pocket. The direction in which we were working was placing us almost due south of the area that Frank Perham worked in the 1960's. Here Frank had mined through the back of the big Merrill pocket of 1903 hoping to intercept another chamber. Frank had mentioned to us several times that the pockets he had encountered there were buried under large amounts of breciatted feldspar. Pocket 13 turned out to be the never ending pocket as each time we returned to this area over the next several weeks we always found something worth taking home. Armed with our new pocket locating tool, the green tourmaline druse, we began to carefully examine the walls of our st ope for this sign. 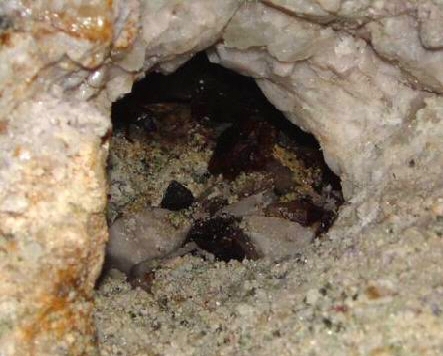 Just to the north of pockets 12 and 13 this druse was quite plentiful. It was mixed in with lepidolite and glassy smokey quartz. As per practice, we first used hand tools to try to locate and open any small cavities or a pocket proper. Every once in a long while this does happen. So when this 'low impact' approach bore no fruit, we moved up to our CP-9 pneumatic hammer drill. With this we can quickly drill holes up to 15cm in depth and about 1cm in diameter. After drilling at least a dozen, this effort too was abandoned. Now the only thing we could do was to expand our stope above this promising area. We drilled (9) 2.7m long meter holes 4cm in diameter above this area. Using 9 electrical detonators distributed over 6 delays to 125 milliseconds and 12 kg of explosives, we were able to carve out a notch above the mineralized zone 4 meters wide and 2 meters high. The blasted pegmatite was ejected down the stope making muck management a little easier. Once the mucking was completed, we were ready to use our small lifter drill to explore the mineralized area. Using horizontal holes, we drilled directly in to the well mineralized part hoping to intercept a pocket and thus avoid it in the subsequent blasting. During the drilling, we drilled into two very soft spots about a meter or so in. We had drilled a total of 6 holes in a pattern similar to the first 9. We chose to blast two of the holes adjacent to the soft areas. Examining the blasted material we could see that we had broken into a small space filled with gray/blue mud. This is generally not a good sign as these muds are typically the end product of some aggressive replacement process. Often they still retain the shape of whatever was replaced. 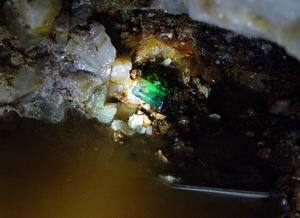 Typically spodumenes and tourmalines are the victims of this process. As feared, everything in this pocket, 14-06, had been altered save for the quartz crystals and one small piece of light blue tourmaline. To the left is an image of 14. Note the abundant mica books and lepidolite surrounding the opening. The other soft spot proved to be a better pocket. As we were drilling the holes near this area the drill cuttings came out of the hole resembling oatmeal. This is mica as it is chewed up and mixed with the water used for dust suppression. When we finally opened the pocket, 15-06, it had a roof composed of mica books with their tips pointing down. Though very near 14, this pocket had not undergone any alteration. 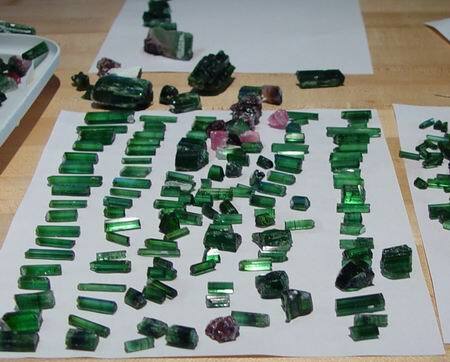 It was in fact another good tourmaline producer. The material was much the same as 12 but without the large tourmalines. There was no watermelon in this pocket. 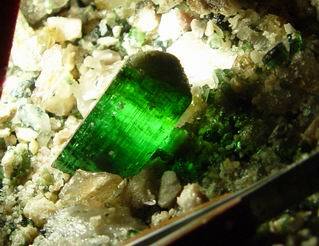 Small tourmalines filled the pocket and the narrow spaces that radiated from it. Now a familiar theme, we again followed a seam of green tourmaline to the next pocket, 16. This pocket was only a meter behind 15. 16-06 was similar to 15 though it was smaller. As we carefully worked the small satellite cavities along the pocket walls, we found our first really good loose nodules. Both were totally gem and very brilliant. Each of them was dichroic. The green nodule was decidedly blue on the A axis and yellow green on the C.
After 16, the working face still looked good in practically every direction. On the right or southern side of the stope we could see that the pegmatite was plunging rapidly. 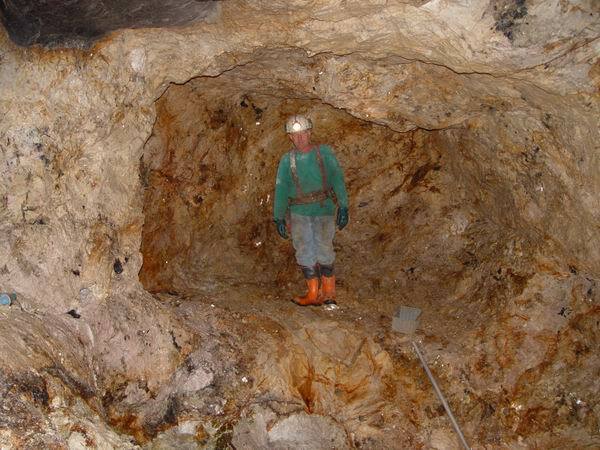 In order to work down to the mineralized zone we would have to lower the floor on the this side considerably. We were willing to make this investement in time and effort as we suspected this sudden change in the pegmatite, the plunge, may have precipitated some major feature. So far we in our work at Mount Mica we have seen that the big pockets are associated with abrupt changes in the attitude of the pegmatite. ( 7-04, 26-04 and 11-05). In May we had hired a track drill company, PDK of Yarmouth, Maine, to do a number of exporatory holes. They drilled more than 15 holes to a depth of 25 meters in an arc around our underground workings. These holes allowed us to gauge the depth of the pegmatite, its thickness, and its gross composition. Though perhaps not as informative as core drilling, the cost per foot is more than 10x less. 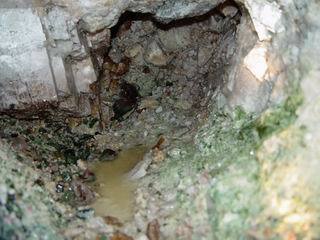 Once the drill intercepted the pegmatite, we collected the drill cuttings which were then washed and screened. One of the holes we drilled was very near where we were working and we used this as our control as we knew this area was productive. There was no marked difference in any of the cuttings amongst all of the holes. 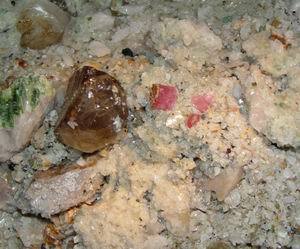 Each contained feldspar, mica, quartz, schorl and, most importantly, garnet. A disappearance of the garnet line would indeed be a bad sign and probably mark the end of the tourmaline pocket zone. 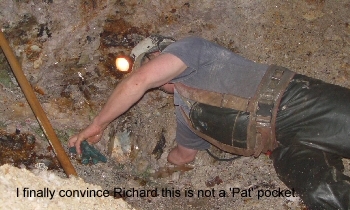 We learned from this work that the point were we were working the pegmatite was 13m below the surface. 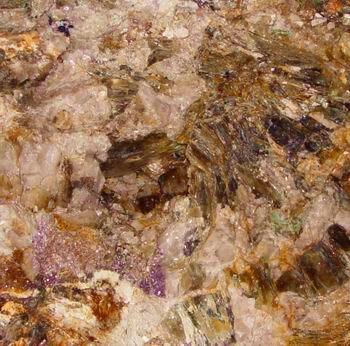 To the south and east of this point by a distance of 25 meters the pegmatite was more than 23 meters below the surface. This near doubling in its depth could not be explained by the dip of the pegmatite alone. It must also have plunged. This re-enforced our notion that, to our right, the pegmatite descended rapidly. Once we had lowered the floor on the right side we found we could finally drive loader up the stope. Now Richard could scoop the muck at the working face and drive it directly to the muck pile outside. Before this we used our small track hoe to drag the muck down the stope where it could then be scooped up and hauled away. This worked well in the beginning but as the stope became larger it required many passes with the track hoe to get the muck down the stope. Now we used the hoe simply to pile up the muck to make scooping easier. We did not find more pocket behind 13 but we did as we started expanded the advance to the north. 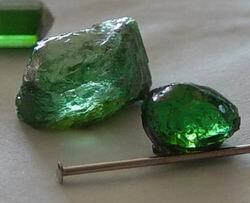 The next pocket, 17, though not large, produced two fine gem tourmaline crsystals. This pocket was 1.5 meters to the left of 13. As we continued expanding the advance left (north) we discovered that the pegamtite appeared to be rising more abrupltly in an easterly direction. Another feature provoked some interest and specualtion. As we were drilling a hole near the upper contact, we drilled schist. At first we thought we had drilled into the contact and adjusted the hole down to avoid blasting into the roof. However, we were soon to discover we had drilled into a xenolith of schist ( dead horse). In the image above it is located to the left above Richard's head. We had seen these features before at Mount Mica. The Dagenais pocket of 1979 was located just up dip of a substantial xenolith. Pocket 11-05 was aligned just south of several huge xenoliths. We made mental notes on this latest occurrence. There was yet one more twist to provoke thought. As we continued mining left, we intercepted a zone of massive lepidolite. This area, perhaps 3 meters on a side, was not huge but it did shutdown completely all pocketing. We had seen massive lithia mineralization before. Each time it had been associated with an abrupt change in emplacement of the pegmatite. While driivng this last advance we intercepted on of the track drill holes we had made from the surface. Though we had been trying to estimate our location below the surface by doing tape and compass mesuarements from one of the large (22cm) holes in the main drift, we were surprised and pleased ot see how far down dip and how far east our pockets were occurring. This meant that we had a great deal of minable rock bewteen where we were and the eastern open pit up dip. It also implied that the Mount Mica pegamtite was nowhere near to being exhausted. Below is a diagram of the of the workings at the end of August.